Fruit in the polytunnel isn't too far behind. Even after the freezing weather recently - it's surprising just how fast they'll catch up! The frosty but bright and sunny days have warmed the tunnels and it's been feeling very spring-like in there. The fruit in there is almost on cue - but outside in the orchard, things are looking about 2-3 weeks behind - because the temperature of the saturated ground is currently well below normal for the time of year. 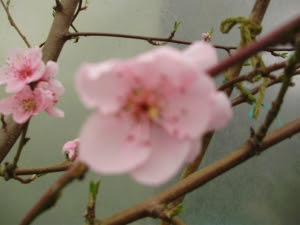 That's just as well - as this weekend is forecast to get a lot colder again, and frost can do a lot of damage to plum and pear buds in particular - because they tend to flower earlier than the apples. One of the things I love most about this time of year is the fruit buds - so burstingly full with the promise of all the deliciousness to come later in the year! Nature's wonderful example of hope and energy. At this time of year you can almost see buds everywhere are growing visibly every day - and I would dearly love to have a time-lapse camera! It makes good sense to grow as much organic fruit as we possibly can ourselves and not be too dependent on buying imported produce, whether it's just a few berries, or if it's tree fruits like pears or peaches. Imported organic fruit like peaches and apricots in particular are always scarce and expensive in the shops or markets. Locally grown peaches - especially organic, are simply non-existent here in Ireland! One or occasionally perhaps two varieties of apples are available but you never see the very best tasting varieties - only those that have been bred to travel well without bruising and produce huge, cosmetically perfect crops for supermarkets! Your own fruit from your back garden or allotment is tastier, fresher, far more full of nutrients and has a much lower carbon footprint than any you could ever buy! If you're also an organic gardener like me - then it additionally has no nasty toxic chemicals, either in it or sprayed onto it after harvesting in order to preserve it! At this time of year, when much of the garden outside is still barely waking up - most of the fruit action is happening in the polytunnel. There - everything is already awake and getting ready for another summer's production. What a lovely thought - so much delicious fruit to look forward to! The pears and plums are always the first to burst open outside - and the pear trees in the 'new' orchard are already swelling huge clusters of fat buds! Pears are one of my favourite fruits - so just looking at those buds makes my mouth water! I must say I've been very impressed with the quality and great value of most of the fruit trees from both Lidl and Aldi. The only problem is that the apple trees rarely indicate what rootstock they are grafted on - which is a vitally important omission because it's not just important to plant the right one for your soil but also it's an indicator of the eventual size that the tree will grow. Also occasionally other trees like peaches will just say 'Peach' which isn't exactly helpful if you want to plant a couple of different varieties so that you have a long season of fruiting! ============This weekend I'll be getting on with planting more trees in the new orchard as things are getting very urgent with all the recently arrived bare-root trees showing signs of swelling their buds! Panic time!! If it rains as it's forecast to do - then I'll just have to pot up the remainder - but I would prefer to plant direct into the ground as I find they always establish far better. Some Advice for New Peach Tree Owners! For anyone who has bought a peach tree recently - here's a few tips on how to grow them! You won't believe how easy it is to grow peaches in Ireland! And if you grow them undercover in a polytunnel, where they are protected from rain - then they won't get the dreaded 'peach leaf curl' disease. They're not fussy about soil - but like good drainage. Just fork over soil, add a little compost, and a small handful of seaweed meal to provide potash and encourage biological activity, and another small handful of bone meal to provide phosphate for root development, working them into the soil. It's also useful to sprinkle some Root Grow directly onto the roots when they're in the hole, before covering them. This preparation is widely available in garden centres now and it's a mixture of mycorrhizal fungi which develop a network of very fine fungal threads that work symbiotically with the plant's roots - enabling them to be far more effective in taking up nutrients from the soil. Peaches and Nectarines can easily be kept as small as you like by pruning - and this is especially important to do immediately after planting, in order to give the tree time to develop a good root system which will help the tree to fruit much better later in life. Pictured here is a 3 year old 'Fush' - as I call it - a sort of cross between a fan and a bush shape, which keeps the peach tree branches within a fairly restricted space, but allows for much more fruiting than the normally much more restricted 'fan' training would. If you're planting a young tree in spring - you MUST prune every branch back immediately, selecting the best to give your tree a good shape by leaving just 2 or 3 buds on each of the larger growths. Try to imagine the shape your tree will grow. The buds will then grow out vigorously and produce lots of fruit next year. I grow my trees as what I call 'Fushes' - a sort of cross between a fan and a bush. They produce far more fruit than fan -trained trees - but don't take up as much room as a round, 'mop-headed' tree. This also means they don't need laborious 'tying-in' to supports! Don't be tempted not to prune and to leave branches un-pruned the first year - hoping you'll get fruit this year as a friend of mine once did, against my advice! She lost her tree altogether, as although it flowered the first year - it couldn't cope with trying to establish roots and produce fruit at the same time and she killed it! It's a common mistake many impatient people make sadly! Patience always pays off! Peaches fruit best on the young green growth formed the previous year - not on the brown, older wood. So it's important to prune them every year immediately after fruiting. Pruning like this also means that they're easy to keep within bounds to the size that you want. Even quite old trees will produce new buds out from their trunk - a very useful attribute if they get too big because it means that you can be quite brutal and prune them right down to the trunk!. This year I've only seen one or two bumblebees around so far - so it looks like I'll have to do a lot more pollinating myself this year if I want a good early crop in July! 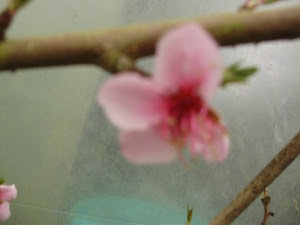 The early peach growing in the bed at the top of the east tunnel is just starting to flower, and the dwarf peaches in pots in the west tunnel are already in full bloom as they're always earlier. These will have to be protected on the coldest nights - but the dwarf ones are easy to cover with fleece, being only shoulder height. The early peach in the ground is a bit more difficult. The blossom still needs protection on the coldest nights if a very severe frost is forecast, so I use a big sheet of fleece to cover as much as I can of the tree, using a 5 ft long blunt ended bamboo cane to help reach the topmost part of the tree. I use the same cane for 'fleecing' most things this year - it makes a useful extra arm now - since my accident 3 years ago when I smashed my right arm and shoulder, I can't extend my right arm above shoulder height to reach things which is a bit of a nuisance to put it mildly! But one gets used to it and there's ways around most things with a little initiative. One just has to think laterally, be inventive and learn to do things differently! Determination is really all you need - and I refuse to be beaten by anything! For the last few days, whenever it's sunny and the wind has dropped enough to have the tunnel doors open, there's been a few bumblebees busily helping with the pollination so insects are starting to wake up. That's just one of the reasons I grow so many flowers in there - the insects are attracted to the nectar in them and then I get the benefit of them pollinating the peaches as well! I re-homed a couple of ladybirds the other day that I'd found crawling up a sunny wall. I put them on the nettles I always leave in the corner of the tunnel, where they should find some early nettle aphids for breakfast and they're safer from the keen-eyed birds. Small birds like Wrens, Robins, Sparrows and Dunnocks always come into the tunnel at every opportunity, as they know there's always insect food in there that they won't find outside just yet. There still aren't that many bees around though, and if you have early peach or apricot trees in the tunnel they'll need pollinating during the middle of the day, while the polytunnel is as warm as possible and the pollen is 'running'. The best time to do this is around midday if you can. The trees will then need protection at night with a light covering of fleece if a very severe frost is forecast, to protect the developing embryo fruit. I know it seems like a lot of fuss and bother - but when you sink your teeth into that very first late June peach - you'll be so glad you did! I always save the very last of my frozen peaches from the previous summer to eat now - just to remind me of how utterly delicious they are, Then all the pollinating doesn't seem quite so much of a chore! Accompanied by a tiny glass of home made peach Schnapps, I just fly along pollinating! A. It's easy to tell which flowers to pollinate. This pale pink flower has only just opened and is not yet pollinated. 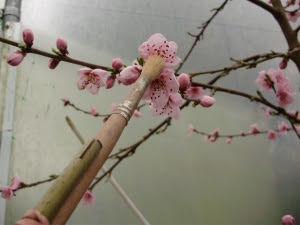 C. Pollinating peach blossom gently at midday with a soft paintbrush fixed to a cane so I can reach the top ones! I'll be pollinating my two fan trained peach trees and the dwarf potted peaches and apricots every day for the next couple of weeks. I don't just rely hopefully on any early bees, because the fruit is far too precious and only available once a year! I work over the trees with a soft paintbrush fixed on the end of a bamboo cane so I can reach right to the top, very gently transferring pollen from one blossom to the next. Midday is generally the driest time in a tunnel when it's been open for a few hours and the humidity lessens, so that's the most effective time because if the pollen is wet it won't work. A day or so after pollination - you'll see some flowers develop a deeper pink staining in the centre of the flower which you can see pictured above. This means they've been pollinated and the fruitlets have set successfully. It's quite easy to see then which ones you've done already - so you don't have to do every single flower again, just the very pale flowers which have only recently fully opened. It's a very fiddly job and being an impatient person it's not one I look forward to - but actually it only takes about 15-20mins to do quite a large fan trained tree - so I just steel myself and think about warm summer peaches. To encourage myself over the last few years, I've got into the habit of leaving the very last of the frozen peaches from the previous summer to eat now - that reminds me of exactly why I'm doing such a fiddly job! They really taste fabulous, especially semi-dehydrated - which concentrates their flavour - and then half frozen to preserve them as although frying them completely would preserve them - it ruins their fabulous taste - which is the absolute essence of summer! Last year I tried to count the fruit on both of my 8ft wide 15ft high fans planted either side of the north door of the large east tunnel - but I gave it up as a bad job at well over 200 fruit on each! 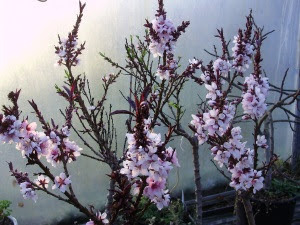 The dwarf trees in pots won't produce as many but they'll be a bit earlier, so the peach crop is spread over about 2 months. Now is absolutely your last chance to finish pruning everything outside except stone fruits like plums and cherries, which are best pruned when they start back into active growth, to avoid silver leaf disease. Pruning can be a very confusing thing, with the result that many people often don't attempt to do it at all - and end up with very little fruit as a consequence. A few years ago I came across a really useful book on pruning, which I can thoroughly recommend. It's in the Alan Titchmarsh 'How to Garden' series from BBC books - entitled 'Pruning and Training'. I have to be honest that years ago, I wasn't that keen on his presenting style compared to the wonderful and very sadly missed late Geoff Hamilton. However, he rose in my estimation considerably when he started gardening organically as Geoff did! Unlike some of the more recent celebrity gardeners - he is also extremely knowledgeable - as he was not self-taught. He trained at The Royal Botanic Gardens at Kew, so he really knows what he's talking about when it comes to pruning not just fruit, but everything else too. I know it's a book I shall refer to often - even though I already have quite a collection of really old fruit pruning and training books. He really IS an expert and the book would be very useful if you're new to gardening in general, or even just to fruit growing in particular. It's really comprehensive - and is also the first book I have ever found that actually explains clearly how to prune a Kiwi fruit! (I learnt by trial and error) It has very concise, clear diagrams - from planting through to maintaining. It's altogether an excellent book for advice on pruning almost everything. Don't forget that when you're reading books written by most 'experts' - that they're often resident in the south of England - where they would normally have a much warmer and drier climate compared to ours here in Ireland! Their advice often doesn't take into account the fact that there are people who actually live somewhere else! Our climate is normally much wetter here and also a week or two later - so take that into account and adjust for your particular climate when following their advice. So many of these 'experts' either seem to have half of their book written by someone else - or have never actually done what they're telling you to do - a fact which is often obvious if you're someone who has many year's experience of gardening. I've often found that good fruit nursery catalogues can be a far more reliable source of useful information than many books - and they're free! After you've pruned your fruit trees and bushes, you need to feed established ones - if you haven't done that already. A few handfuls of seaweed meal (potash to encourage flowering and fruit), and if necessary, a good general feed such as the certified organic Osmo Universal granules which are useful feeds for most things as they are well balanced and encourage the beneficial bacteria vital for proper uptake of nutrients by tree roots. Blackcurrants need a bit more nitrogen as they need energy to make new growth each year - so use some rich compost, chicken or even pigeon manure (both must be well composted to avoid burning roots). I find Osmo granules very useful for everything and they are certified organic. You may have added a long acting fertiliser such as bone meal and seaweed meal to any recently planted fruit at the time of planting, so just give these a good mulch to keep weeds down and keep moisture in. Grass clippings will do for this but remember don't pile them deep too close to the stem, keep a few inches away or they may cause stem rots. This will keep weeds down, keep the roots and cool and encourage good root development and biological activity. Remember - keep off all soil if it's still very wet. Work from the paths or put down a wide plank or two to walk on in order to spread your weight, to avoid compacting the soil. Compacting soil damages the drainage by squashing air out of the soil. Don't forget that soil life needs air too! By the way, I'll just repeat again that you do not have to prune down all fruited stems of autumn raspberries now. If you leave some of the stems, maybe 1/3rd - 1/2 of last year's, then they willl fruit again, lower down the stems, in early summer. After that you can cut them right down to their base and the new growth from those will fruit a little bit later. This spreads the crop conveniently and does no harm to the raspberries at all, as long as the clumps are well established and well fed. If you're just buying them then 'Joan J' or 'Brice' are the best two varieties available currently - I grow both of them. The yellow variety Allgold or Fallgold (as it seems to be called more often now is also good). I've grown 'Joan J' in large pots in the fruit tunnel for the last four years now and they have been a great success, producing huge delicious fruits continuously until almost Christmas! I did a bit of my favourite sort of retail therapy a few days ago! Not for me handbags and shoes!! Strawberries are the sort of retail therapy that makes me happy! Ken Muir's Nursery in the UK have a new variety of perpetual strawberry called Finesse! Squeals!! I'm so excited - their wonderful variety Albion has been a great favourite of mine for many years, it's so reliable and delicious that I've given up most other varieties! Being a 'perpetual fruiting' variety - it fruits from early May until November in the tunnel and I think it has the best taste of any strawberry apart from the old variety Gento, which I brought here from the garden I where I grew up. Gento was bred in France in the 1960's and is without doubt the nearest in taste to wild strawberries. It has that meltingly delicious and incomparable flavour. It doesn't travel well though because it bruises easily and starts to deteriorate the minute it's picked, which is probably why it fell out of favour. It hasn't been available as plants for about 30 years at least, so I really treasure mine - quite apart from the sentimental value. I grew up eating it and so did my children - and I've been propagating from those same original plants for almost 40 years now! Don't believe those who say you shouldn't do that! As long as you only ever propagate from the healthiest and most productive plants and then rotate them around the garden - changing their location every few years to avoid any build up of pests and diseases - then it's perfectly possible! Gento is actually one of the parents of Mara des Bois - which has inherited much of it's flavour but is smaller and not quite as productive. Albion is a good alternative - it's very productive, delicious and a great choice if you want a really good strawberry that fruits all summer long. It freezes well too as it's juicy berries are nice and firm. "An outstanding perpetual variety which combines heavy yields with great fruit quality, excellent flavour and good disease resistance. ‘Finesse’ produces bright red, medium to large heart-shaped berries which are both sweet and juicy. Plants are vigorous, producing very few energy-sapping runners, resulting in heavy crops of up to 1.2kg (2.6lb) per plant." So there you have it - straight from the horse's mouth! I can't wait for my new plants to arrive in a few days time - it will be just like Christmas again!! Many of the mail order nurseries have good offers right now. Prepare the ground well and then water and mulch after planting. Never mulch dry soil - always water first. A few years ago I was asked to visit a garden to give some advice on pruning raspberries, and discovered that sadly, the person asking had planted autumn and summer ones right next door to each other - with the result that they had all become so mixed up that it was absolutely impossible to tell which was which! Never plant summer and autumn fruiting raspberries close together - always keep autumn varieties segregated and under strict 'house arrest'. The summer ones are slightly more genteel, and don't have quite such territorial ambitions! Autumn varieties like Autumn Bliss and Heritage in particular can spread sideways at a very alarming rate once they've settled in, and summer and autumn varieties can easily become muddled up and indistinguishable very quickly if they're planted near each other! A few year's ago a friend called me to ask if I would show him how to prune his raspberries. When I went to his garden I saw that he'd actually planted them close together and they were a complete muddle, making it impossible to differentiate between the two! Enough said! Birds help to keep fruit pests down - until they become pests themselves! Talking of greedy feeders - don't put fruit cage netting back up yet, wait until the fruit is forming. The birds need to be able to get in to the fruit bushes and canes to help clear up any pests like blackcurrant blister aphid or gooseberry sawfly caterpillars (which can completely defoliate a large black or red currant bush literally within hours!) Hang a peanut feeder in there to attract the the birds, and they'll also do a good job 'working over' the bushes while they await their turn! DON'T use nasty detergent-based washing up liquid sprays on them as I saw one gardener on a TV programme doing a few years ago - they unbelievably claimed they were biodynamic gardeners!!!? Washing-up liquids contain formaldehyde and other nasty chemicals in many cases - but even if they're organic - they're unnecessary and can harm beneficial insects. If you have bantams or chickens, You can use an old fashioned organic method that I remember my father using every winter in the kitchen garden of the house where I grew up. He used to run some of our poultry into the fruit cages throughout most of the winter. Chickens are amazingly efficient pest clearer-uppers and scratching around under bushes for grubs is their natural behaviour since the come from the jungle! I had a bad case of sawfly many years ago when I first planted some new bushes which were obviously carrying it. The chickens cleared up the pupae that overwinter on the ground very efficiently over the following winter - eating all the grubs before they could crawl up and do any damage to the bushes. I've never had a problem with it since! Poultry also gradually supply a good hit of nitrogen for the following spring and keep weeds down, doing three jobs at once! Don't leave them on ground too long though - always take them out before early spring - or they will 'sour' it with too much nitrogen. Tidy up outdoor strawberry beds by cutting off any old, dead, spotty and yellowing leaves from plants now, scrape off any old straw or bark mulches from beds, letting birds in again, clear any weeds and then feed with seaweed meal, watering it in if dry. Then mulch with good compost if possible, keeping it away from the necks of plants to avoid possibly encouraging rotting. If plants are loose and pull up easily then suspect vine weevil and treat with nematodes. The same applies to strawberry beds under cover, if you haven't dealt with them already. Some of the early varieties are in bud and the alpine strawberries 'Reugen' are already flowering in my tunnel. Hoverflies love them and a small row somewhere in the tunnel will attract in lots of them, as well as fruiting all summer long, often until November! 'Reugen' (from Chiltern seeds) is easy from seed and is larger than normal alpine varieties, but with that same exquisite, aromatic wild strawberry flavour. Sown now it will fruit later this year - and after that will barely stop cropping in a polytunnel! Last year we had the first fruit in April! They tend to hide their fruit among the abundant leaves though - which as a bonus as birds don't find them so easily but that also means that they're hell on the back to pick! One has to bend over for ages to pick a whole row of them - even in a raised bed! Every year I give my 'stepladder garden' a makeover and grow something different. Last year it was the 'Reugen' alpine strawberries and it saved a lot of backache!! Early summer fruiting varieties of strawberries, like 'Christine', or even the excellent perpetual fruiting variety Albion, will fruit quite happily in 2 litre pots, as long as you're careful to remember to water and feed them regularly. This means you don't have to make a permanent bed in the tunnel if you don't want to - which can take up a lot of space. You can put them back outside once they've finished fruiting, to produce runners for next year. 'Christine' is the best flavoured early variety and is very reliable - I always have fruit from that in early May, and I find that with the protection of the tunnel - the perpetual varieties follow on quite soon after - often fruiting until November. Those can also be grown in pots but they need larger ones to produce well continuously over the summer and autumn. 'Albion' is the very best perpetual for this way of growing - or in fact any. Mine fruit from May until November in the tunnel - and you can't ask for more than that! They need feeding regularly if they're in pots, with a good organic tomato feed like Osmo. And do keep an eye out for vine weevils - if one or two plants suddenly wilt and the plants become loose, it could mean that little devils are eating the roots! There are nematodes to deal with them which are a good organic option - you can buy them online. Peat composts encourage them - so not using those is better from every point of view - not just for environmental reasons! Pot-grown, bush trained grapes 'Regent' & 'Muscat of Alexandria' in early August - with my unconventional clothes horse supporting the massively heavy crop! It works! You can still plant grapevines from pots, either inside or outside, in the ground or in pots. Prepare the site well because they'll be there for a long time and use a good mycorrhizal fungi product like Rootgrow, to dust the roots before planting. This will expand the reach of the roots and their nutrient catching ability hugely. Grapes like a really well drained warm spot outside. If you want to grow really good desert grapes, then I think that planting them in a polytunnel or greenhouse is best though, unless you live in the sunny south east of either Ireland or the UK. The north side or end is best - where they won't shade anything else during the day. Training them over the end roof arch, as I do, is also a good utilisation of space that's often wasted, or alternatively you can train them at about 1 metre high along the sides, where again they don't shade anything else because they come into full leaf well after any winter lettuce or other light-hungry crops are finished. Although it's normal to prune things after they're planted, you mustn't prune indoor grapes now or they'll bleed! It's too late now as the sap is rising strongly. It's a mistake you only ever make once believe me! I did it a bit too late once and it was just like turning on a tap - the sap just poured out as soon as they were cut! Don't worry though - in couple of weeks, when the buds start to swell noticeably and break - you can then pinch out or rub off any soft shoots that you don't want, or are growing in the wrong direction. Those young green shoots won't bleed. Growing grapevines in pots or tubs is great fun as they're so flexible and can be trained into a variety of different shapes. Pots of trained grapes were something the Victorians were very fond of using to make centre-pieces at their elaborate dinner parties. You can also grow them as spiral 'bushes' in pots which is fun, tulip shapes or even 'umbrella' standards - allowing several permanent stems about 3-4ft/1m. to develop. When space gets tight you can put them outside for the summer in a sheltered spot, just bringing them in later on to ripen - safely away from the hungry blackbirds and wasps which love them!! This week I'm potting up the last of the grape cuttings I took in December 12 months ago when pruning - they've nearly all rooted well - about 90%. It's a very easy way to increase your vines, as cuttings take very easily. You can even do what some of the old kitchen gardeners did if you only want one plant - you can train a shoot up through a pot from the bottom - the shoot will root gradually over the year, if you keep the pot moist. You can then sever the shoot at the bottom in mid-winter when the shoot is dormant and it can be detached! 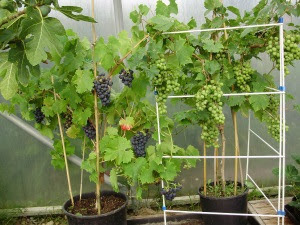 It's a great way of increasing a grapevine if you've forgotten to take cuttings at the right time in winter, like me this year - so many people have asked me for Muscat Hamburgh - which is the very best seeded black dessert grape. It's even self-thinning! Thinning bunches of seeded grapes really IS something I have absolutely no patience for! The problem is that with some varieties that make very tight bunches, these can attract moisture and therefore disease. I'm sadly removing one very good tasting variety Perlette this year because of this. If I had a gardener or had time myself to thin the bunches it would be fine. It has a really fabulous muscat flavour and always sets dozens of bunches - but I'm afraid it's sadly time to say goodbye now after 20 years of growing it for varieties more suited to organic growing and my lack of time!! If you have grapevines in pots - lay them on their side now to ensure that the buds break evenly all along the rods or stems. That's if you haven't done that already. If you don't do this the buds at the top get all the plant's energy when the sap rises, then some of the lower buds can be weakened or may not develop at all. I've just noticed the buds on all my potted grapevines starting to swell now in the tunnel. They're always a bit earlier than those planted in the ground. It's a very good way to grow some of the later ripening grapes, as being in a pot tends to encourage them into growth just a little bit earlier, so they then ripen earlier. You should already have untied and lowered the rods (or stems) of all grapevines growing in the ground as far as possible for the same reason. At this time of year I take down the smaller netting at the top of the tunnel entrances, just leaving up the big square-meshed pea and bean netting which keeps the hungry pigeons out. If I don't take the small netting down - the bumblebees can't get in, or get stuck trying to! It must be put back up before the strawberries are ripe though, as my blackbirds have perfected a brilliant rather 'hobby-like' dash method of last minute fast 'wing folding' - flying straight through the larger mesh - I've watched the crafty devils do it! Greedy little blighters that they are - especially considering that I grow lots of fruit elsewhere which is left specifically for them - but they still want mine as well! The tiny embryo fruits will be starting to swell rapidly on indoor fig trees now. At this stage they are large pea sized - these are very easy to distinguish from any small to middle-sized fruit which may have developed late last autumn after the main crop. Although they may have appeared to have survived over the overwinter - those larger figlets, one of which you can see in the picture here, should be taken off now as they won't develop properly and may give off a hormone signal to the plant which stops the smaller others developing - or it may possibly start to rot and spread disease. Either way it won't develop and ripen. In the picture here you can clearly see the difference between the two. Also take off any 'mummified' and wizened undeveloped fruits or they could spread diseases. Prune back overlong or weak shoots and those not carrying any embryo fruits by about half, to stimulate production of fruit buds. It looks as if I may have a good crop on all my potted bushes again this year - I'm hoping to have enough to dry for the winter - they're one of my favourite fruits. The only problem with them is that they're so delicious fresh that we tend to eat them for breakfast or lucnch every day when they're in season and I never get a chance to dry any! Weed the tops of tubs or pots now, scratch off a little of their old compost from the top and replace with a fresh compost/earth mix enriched with some added seaweed meal and general organic fertliser. At this stage you may notice some suckers and this is a great way to increase your stock if you want to. Figs grow like weeds and are very easy from these 'Irishman's cuttings'. There's still just time to sow Cape gooseberries (Physalis Edulis) - which is a tender perennial fruit. 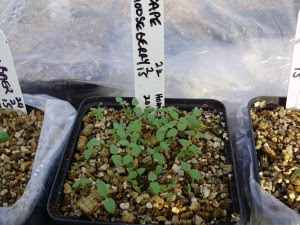 They will germinate in about 10 days in a warm propagator. They're now being touted as the next 'superfruit' and called 'Inca berry', Pichu berry or goldenberry - dried ones cost a fortune in health food shops where you can't even find organically grown ones! Those little paper 'lanterns' that seem ubiquitous on every smart dessert plate now? (I've had a sneaking suspicion for a long time that many people don't know what they are - so don't eat them - that restaurants may actually wash & 'recycle' them from plate to plate!) They're very expensive to buy in the shops, but unbelievably easy to grow if you have the space (they grow like weeds and make a 5-6ft wide and high bush eventually). They appreciate the protection of a tunnel. If you grow physalis in the ground they can become very vigorous and take over - making far too much leaf, and as they are also tomato family - it's easier to fit them into rotations by growing them in containers too. I grow mine in 10 litre buckets and they're quite happy. When properly grown and ripened, they're delicious and will last for literally months in their neat little paper cases. A few years ago I experimented with some that I picked in November - to see just how long they would last - and they kept well in the salad drawer of the fridge until the following May! And astonishingly tasted as good as ever! The best thing is that as they come ready packaged, the birds don't know what they are so don't eat them - and not even the mice have discovered them yet either - a valuable attribute! Don't get the dwarf variety though - it's a complete waste of time - producing very little fruit. In a mild winter Cape gooseberries will overwinter in pots in a tunnel or in the ground - and those plants will fruit much earlier than ones sown the same year. I've found it difficult to keep them going in pots for more than two years though. As with figs, again weed, renew the top compost and feed these. If you see any scale insect on trees - then deal with it now before the tender new shoots start to grow. Either use an organic insecticide based on fatty acids, or gently warmed coconut oil painted on with a soft brush. These are greasy and stop them breathing through their skins - they then die and fall off. Slighty warmed melted coconut oil brushed on is effective. Black unsightly 'sooty mould' is usually a symptom of scale insect - it's a fungus which grows on the 'honeydew' which the scale insects excrete - so if you see this then look closely at the leaves - particularly underneath on the leaf midrib and on the stems. You can start to feed lemons now with a high-nitrogen feed like Osmo liquid feed or nettle liquid feed, as soon as you can see growth starting. Never use chlorinated hard tap water on citrus trees - they hate it. Treat them as acid-soil lovers like rhododendrons and they'll be happy. If they leaves are looking a bit yellow after the winter, a dose of sequestered iron like 'Sequestrene' (available in most good garden centres) will also help to green them up quickly again, diluted into some rainwater. If you grow even a small amount of your own fruit organically - you can pick and eat it straight from the garden, warmed by the sun, perfectly ripe and at the very height of it's nutrition. Recent studies show that organically grown fruits and vegetables are 60-70% higher in phytonutrients!